Follow along with this Search Console Setup Checklist to make sure all your bases are covered! You have a website. Great! Now, how do you make it show up in Google? Here’s the secret: your website will show up in Google whether it’s verified in Search Console or not. Verifying your website in Search Console means verifying that YOU are the owner of the site, and are qualified to see the data Search Console provides. If you want your site to rank well for relevant keywords (and increase the chances of prospects & customers finding you) then you need this data. You’re not going to find it anywhere else! Tells you how your site is performing in Google search results through impressions, clicks, position, and keyword data. Helps you assess your website’s “health” by tracking errors, links, and other technical data. Reviewing this information can help you update your website to accurately target prospects. However, if you’re not experienced with making changes to your site, we recommend having a professional make the changes for you. Many technical changes can break your site if you’re not careful! If you’re not comfortable with making changes to your site’s template to set up Search Console, contact an experienced professional. We are one of many agencies who can provide assistance. You can follow along with the steps below with this checklist. You can access Google Search Console here. You may need to switch to another theme to see the header option. In this field, copy & paste your website’s URL from your homepage. It should include HTTP or HTTPS at the beginning. It should NOT include any text after the .com/, .org/, .net/, or whichever variation your site uses. Now you’ll be given a few options. Generally, we find it easiest to select one of the Alternate methods - either Google Analytics or HTML tag. You should receive a success message. If you did, congrats! If you didn’t, double check the requirements above. If you still receive an error message, try the alternate HTML tag verification method below. Select the “HTML tag” option. Copy the ENTIRE code snippet in the white box. All of it! Open your website’s header (instructions under Step 0, #2 above). If you have a HubSpot or Squarespace website, simply paste the code into the header section. If you have a WordPress website, make sure to paste the code between the <head> and </head> tags. Directly under the first <head> tag should work fine. Step 5: Save Your Changes! This requires an entirely separate step because it’s important. ALWAYS remember to save your changes, or it won’t work! 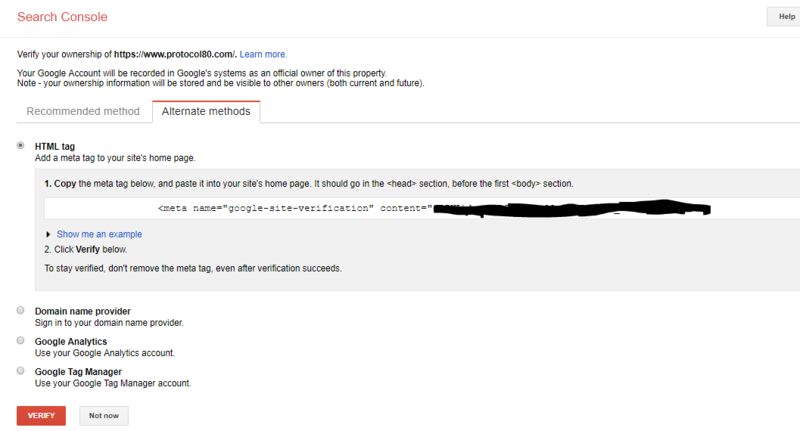 Return to the Search Console screen and select “Verify.” Most website owners will see an immediate successful verification message. If you see a “Verification failed” message, review the steps above and make sure you didn’t miss anything. You can use this helpful checklist just to make sure. If you’re still seeing a failure message, wait 1-2 days and try verifying again. You will NOT have to perform Steps 1-5 again. Just click Verify! Contact a Google expert (anyone with the Google Partners badge should be able to help) and have them set it up for you. Contact us for assistance with setting up Google Search Console!